The Brazil international posted furious comments on social media after last week’s Champions League tie. 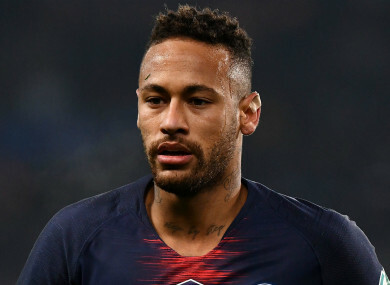 UEFA HAS OPENED an investigation into comments made by Neymar on social media following Paris Saint-Germain’s Champions League exit at the hands of Manchester United. The Brazil international watched from the stands at Parc des Princes as United claimed a 3-1 win in the second leg of their last-16 tie to progress to the quarter-finals on away goals. Marcus Rashford scored the crucial third goal from the penalty spot after a contentious handball decision against defender Presnel Kimpembe, prompting a furious response from Neymar on Instagram. Uefa confirmed today that it has appointed an inspector to look into Neymar’s remarks. “In accordance with the Article 31 (3) (a) of the Uefa Disciplinary Regulations, Uefa has today announced that it has appointed an Ethics and Disciplinary Inspector to conduct an investigation regarding the comments made on social media by the Paris Saint-Germain player Neymar Junior, following the 2018-19 Uefa Champions League match between Paris Saint-Germain and Manchester United FC, played on 6 March 2019 in France,” a statement read. PSG head coach Thomas Tuchel defended the player for his outburst, saying after the match: “Sometimes after a big fight you use words and reaction emotionally that you take back some hours later. Neymar has not played since suffering a metatarsal injury in a Coupe de France match against Strasbourg on 23 January. Email “Uefa investigating Neymar's outburst following PSG's defeat to Man Utd”. Feedback on “Uefa investigating Neymar's outburst following PSG's defeat to Man Utd”.